GitHub is a project hosting service used by many open source projects and developers. As a WordPress user, sometimes you may come across plugins or themes hosted on GitHub. Since GitHub is not specific to WordPress development, it may be difficult for a new user to figure out how to download and install a plugin or theme from GitHub. In this article, we will show you how to install WordPress plugins or themes from GitHub. As we mentioned earlier that GitHub is a code hosting service. It is free to use for open source projects, and currently it is the most popular project hosting service among open source developers. It uses Git revision control system, hence the name GitHub. Not only it provides easy tools for collaboration, GitHub also offers social networking features such as following users, giving repositories stars, subscribing to repositories and projects, etc. Github can be used on any kind of projects that want to utilize Git revision control features. For example, Open Source learning resources, documentation projects, manuals, guidebooks, etc. GitHub’s tools allow users to add other users to their projects and work with in teams. Before you install a WordPress theme or plugin from GitHub, make sure that you are able to receive updates for it. We will cover that part later in this article. Installing plugins and themes from GitHub is super easy. It is just like installing a WordPress plugin manually. First go to the plugin / theme’s repository on GitHub. On the main page of the repository, click on clone or download button and then click on Download Zip button. Now, head over to your WordPress admin area and go to Plugins » Add New page. You will need to manually upload the plugin from your computer. To do that, click on the upload button. This will show you the option to upload plugin’s zip file. You need to click on the ‘Choose file’ button and then select the ZIP file from your computer. Next, you need to click on the Install Now button. WordPress will now upload the zip archive from your computer to your website, unzip it, and install the plugin for you. Once it is done you will see a success message. You can then click on Activate Plugin link to activate the plugin on your site. How to Get Updates for WordPress Plugins Installed From GitHub? By default, WordPress looks for a newer version of the plugin based on a plugin’s read me file and plugin header which contains the information about the latest stable version to use. However, WordPress does not show automatic updates for plugins downloaded from GitHub by default. To enable users to automatically receive updates directly from GitHub repositories, theme and plugin developers need to make a little extra effort. To achieve this some plugins and themes from GitHub may already have included the code which will enable you to receive automatic updates. In some cases the theme / plugin developer may ask you to install GitHub Updater plugin. 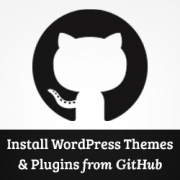 Which will enable you to get updates for GitHub plugins and themes utilizing this method. In either case, you will have to contact the plugin/theme developer on GitHub and ask them about the updates situation to be sure about receiving updates when they release a new version. 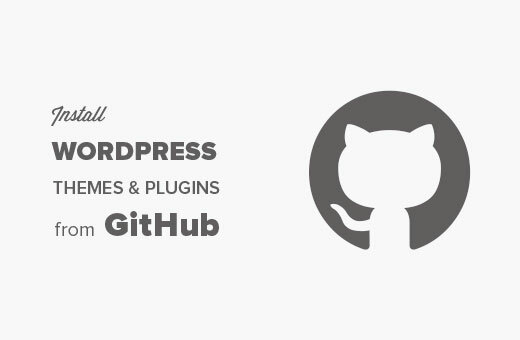 We hope this guide helped you install WordPress plugins or themes from GitHub. If you like the plugin or theme that you are using from GitHub, then don’t forget to star that plugin on GitHub. This will let the developers know that you appreciate their effort. Let us know what interesting WordPress projects you discovered on GitHub by leaving a comment below. Thanks for mentioning GitHub Updater. It works with plugins or themes hosted on GitHub, Bitbucket or GitLab. As a bonus you can use GitHub Updater to perform a one click install of any GitHub, BitBucket, or GitLab (public or private repos) plugins or themes using only the repository URI vastly simplifying the instructions in the article. GitHub is great-for learning too. I’ve gained so much knowledge just by looking at code from github. Thanks for this nice post! GitHub and StackOverflow are some of my favourite sites for checking out useful scripts that i can use on my blog. I am using one plugin from GtiHub myself…but didn’t know about the GitHub updater…thanks guys! When the window pops-up for you to find your zip file, just paste the URL and it will fetch the link. No need to clutter your computer with files you don’t need. You can actually do a one click install using the Remote Install feature of GitHub Updater. Added benefit is the plugin/theme directory is correctly renamed. Are the plugins found on Github any more “unsafe” than the plugins that are in the repository? Tracy, yes there is a chance of that. In the WordPress plugin repository, plugins go through a basic review process and since it is a larger community an unsafe plugin would get caught much quicker than on GitHub. Can you tell me where to find WordPress plugins on GitHub? Is there a way to search for those open source plugins on Github? I tried on Google search but didn’t find any plugin on Github.